Do-it-yourselfers and party guests alike will love these favor ideas. They combine the qualities of glassware that we love, with materials from our DIY favor store and special touches from our own hands. Fill it. There are probably as many, if not more, “filling” ideas as there are themes and special events. The only firm rule is to make sure that your guests will be able to tell immediately whether the filler is edible or not! Consider the theme and what you want to put inside it when selecting a vessel. Generally speaking, you should go with a simpler container if you want the contents to “steal the show.” A lovingly layered cookie mix usually calls for an old-fashioned Ball jar, for example, while our sturdy Quadra 9-ounce corked bottle is perfect for a homemade flavored vinegar or liqueur. This “rule of the simple” has exceptions, though. If you want to build a mini terrarium for a jungle or garden theme, or a tiny beach of sand and shells for an underwater event, a shapely flat-bottomed snifter is probably the best glass for the job. Speaking of things nautical: for any sort of water theme, look for glassware favors from the Bursting Bubbles line for that extra bit of wit! Wrap it. We love the DIY centerpieces made from large jars, burlap and ribbon we’re finding on Web craft pages, and we now offer the raw materials at terrific DIY prices. Why not translate this decorating technique into favors? Wrapping is a wonderful way to add texture, pull a look together and reinforce the theme. Use burlap and thin twine around the bottoms of our new barrel-style tumblers for a Wild West party or create bows of slim gossamer strips or ribbon for vase favors that coordinate with chair bows or covers. Depending on the individual project, most of these ideas should work well with both imprinted and un-imprinted glassware, though a wrap-and-imprint combo might call for a bit more care in the planning. Embellish it. Find gems, stickers and labels for all themes and occasions for hand-customization of your jars, vases and votive candles such as the elegant specimen shown above at right. Stumps Party offers more do-it-yourself options all the time, so do visit the DIY supply pages soon. No matter where you have your prom, an easy way to make it a memorable event is to combine two themes to make your own! Your prom will be much more personalized for your school and your students. If you do it well, you can tie in a variety of themes. This will also take focus away from the physical location of the dance. Combining themes makes it easier to have a dance anywhere, from the school gym to a banquet hall to a cruise ship! Combining a nautical theme with a carnival theme gives you the opportunity to tie in a few other themes. Subtle hints are all you need—many cruise ships, for example, have a casino room, so you could also incorporate a casino theme. You can also tie in other themes with your favors. If you choose to add the casino theme, section off a portion of your event room with alternating red metallic curtains and black metallic curtains to create a mini-casino! Create Black Jack and Texas Hold ‘Em tables and give your guests personalized poker chips as a fun party favor. A great way to combine prom themes is by mixing up the party favors. Give male prom guests gob hats and the female prom guests feathered masks. Also, rather than simply handing out beads to your guests, work the beads into the centerpieces for your tables! This way, not only will your dance have a much more “finished” feel, your guests will feel like they’re taking home a piece of the dance. You can also place personalized candy jars around the table filled with extra snacks for your guests to enjoy while they’re dancing the night away. If your prom is in a school gym rather than on a cruise ship, you can still combine nautical and carnival themes and make a splash with your students! Use decorations to set the cruise ship scene—hang anchor and porthole cutouts along the walls to give your guests the feeling of being on the lower deck of a cruise ship. You could also hang an ocean background on a wall and place a few lengths of ship’s rail in front of it— your guests will be able to lean over the rail and look out at the deep blue sea! Then, to incorporate the carnival theme, you could create a few different stations with carnival-themed snacks for your prom-goers. For example, you could hand out popcorn, cotton candy, and mini pigs-in-blankets. You’ll probably want to stay away from things like snow cones, as they could stain clothing. The possibilities for a prom with more than one theme are endless! You just have to use a bit of creativity. Combining prom themes will make your even fun, memorable, and exceptionally personal for your high school and your students. When the cold air drops down from the north, bring in the warmth of a remote tropical isle where treasure is amassed and boats drop their anchors. Invite your student body to sail away to a Treasure Bay prom. Stumps Party simplifies your prom committee’s decorative tasks for this tropical themed prom with the help of the Treasure Bay decorating kit. This kit has all you need to transform your space into an elegant island paradise : one Treasure Bay ship, one set of Treasure Bay ship masts, two wire palm trees, one Treasure Bay column and one Treasure Bay chest. Build up anticipation for the treasure that awaits with banners and wall decor. For the hallways, put up a tropical paradise banner. Hold a pre-prom contest. Have students guess what the temperature will be on particular popular tropical islands the day of the prom. Winners will be awarded prom-related coupons delivered in foil gold bar favor boxes. Create the transition into the magic of the tropical scene with by lining the hallways with colorful lighted palm trees. Decorate the entrance into the main area by draping white tulle netting. Add sparkle to the netting with twinkle light strings. Add textural and visual interest to the netting with yellow or blue nautical fishnet available with the Treasure Bay table setting accessories. In the main area, create an easy yet gorgeous sunset by layering sheer gold gossamer over dark blue seamless paper decorating material. Enhance the backdrop’s glow with the use of backlights. Change the tint of the backdrop by experimenting with different colored filters to use on the backlights. Complete the sunset look with the addition of the moonlight hanging moon. Give the illusion of being in a cove by setting up a palm tree silhouette backdrop right in front of the backlights. Introduce water by covering the floor with bunched up mottled water gossamer. Near the edge of the water gossamer place the Treasure Bay ship and the Treasure Bay ship masts. Decorate the masts with white tulle netting to provide the look of sails. Beyond the edge of the water gossamer and into the room cover the floor with buff flat paper to give it the look of sand. On that sand, put the two wire palm trees, the one Treasure Bay column and the one Treasure Bay chest. The 7′ high column adds authentic character with its realistic hemp rope and fishnet accents. To create a fuller nautical look to the room, purchase additional columns as well as some 2′ to 6′ high Treasure Bay lantern pilings featuring hemp rope accents and a nautical lamp. Place some of these columns and pilings around the snack area as well. The snack area easily comes together with the ideas given for the Treasure Bay table setting. Begin by covering the tables with the indigo gossamer drapped with yellow fishnet. Use gold metallic streamer from the colorful metallic streamers collection to secure the net to the gossamer tablecover and to define the ege of the table. Top off the table decor with the palm tree centerpiece surrounded with scattered gold coins. Continue the table decor on the chairs by draping them with indigo gossamer and fishnet secured with more gold metalic streamer. For the food, select black plates, navy blue napkins and black cutlery. Cover the eating area walls with blue sea and sky flat paper elegantly framed with white tulle netting. Allow the sand look to continue out onto the floor with shredded gold / silver mottled gossamer. Give outline and sparkle to the area with additional wire palm trees and pilings. The prom picture is the keepsake to treasure. Arrange more wire palm trees and a cardboard treasure chest in front of the same sunset backdrop used in the main space. Offer the perfect party favor with the trendy photo holder. This favor has room for autographs as well as your prom picture. Stumps Party – a treasure trove of party supplies and ideas. Check us out for all of your needs! Water, water everywhere! So many dance themes contain water features that we’ve put together a few do-it-yourself decorating ideas for your next event. Draw upon the artistic talent in your own midst! If you envision an ocean horizon, sunset-at-the-beach scene or other large seascape, choose a wall and cover it with our affordable but tough seamless paper. Set the resident artist(s) loose with paints or chalk to create a unique and memorable mural! A life-sized tropical island makes a great entrance and/or photo op for midnight cruise, luau, pirate and other tropical and nautical themes. Start with an ocean of “water” using a blue metallic background or similar material covering your floor. Form your island with sand (real sand is great but if that’s not possible, simulate it with our gold gossamer). From there, add your own special touches such as a palm tree or two from our great selection, patches of green tissue grass, flowers and a few coconuts. Spend a little time at Stumps Party Event Supply online store to check out water-related decorations and decorating materials from fountains to fabrics! Dancing under the stars, cruising to an island paradise, walking in a winter wonderland — how we love to bring the outdoors to our indoor events! Here are a few ideas from Stumps Party for pulling it off. Whether a nautical, garden, city or destination theme, nothing is more romantic than a star-lit night. We love the look of combining a star gossamer with twinkle string lights, or try our glow star gossamer on its own! Add holographic shimmer die cut stars or mirror-brite die-cut shimmer stars to the décor to amplify the eye-pleasing effects. This would be great for a Western or desert theme, and more. Try our seamless paper or other heavy background paper to create rocks and boulders of just about any size! The secret: a pillow of air! Cut two pieces of paper of the same irregular shape but with one sheet larger than the other. Match and staple the edges together so the larger sheet bulges out for some 3D action. The technique can take some practice, so if you haven’t done it before, be sure to experiment with scrap paper first. If you’re going to group them together, remember that odd numbers and staggered sizes look best. Need some light, airy clouds in your outdoor setting? Get a bundle of our white tulle netting! Bunch it up into a cloud and secure your cloud formation with a quick baste stitch or staple. Use mono-filament (fishing) line to suspend your clouds from the ceiling, and/or place them on the floor to suit your event theme. Do you have your own tricks for outdoor effects? Please share them in the Comments section! A nautical theme is a classic for prom, and our Midnight Cruise themed prom is a romantic twist, setting your event on the deck of a giant cruise ship. 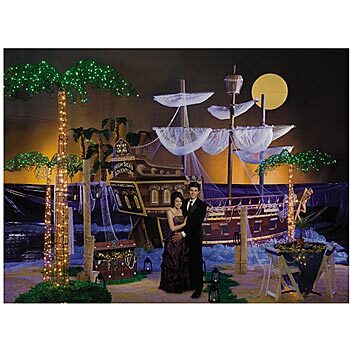 The Midnight Cruise Kit deluxe version has a variety of decorations for creating the theme, which include a midnight cruise ship, a midnight island standee, a midnight cruise scene, a mountain backdrop, two ship railings, and a shaded elegance umbrella-and-base combo. Create a foundation for your decorating kit by setting up the ship’s deck using weathered wood flat paper and adding blue metallic floral sheeting for water. Insert the seaside sunset background illustration to create a gorgeous backdrop. Attach fish netting and twinkle light strings for a romantic accent to the whole scene. Begin using your Midnight Cruise kit by setting up the midnight cruise ship itself. The ship standee is 18’ high and 14’ 6” wide. It’s accented with twinkle lights and can be personalized with your prom slogan or school name on the ship’s body. Behind it, add the mountain backdrop to simulate a gorgeous horizon. To one side, add the midnight island standee for more dimension. Along the line where the weathered wood flat paper and the metallic blue background material meet, add the ship railings. This will create a fantastic simulation of a real ship! Finally, on your ship deck (the weathered wood flat paper), set up the shaded elegance umbrella with its base. The umbrella is 6’ in diameter and sits atop a 7’ 4” wooden pole. The umbrella is available in black, red, or white. Add some elegance with lanterns or nautical metal lamps for a finishing touch. These optional items can easily be added to your kit by specifying the quantities you need on the page where you add the Midnight Cruise Kit to your cart. Once you’ve chosen your decorations, create memory booklets for students to treasure their prom moments with. We’ll print your booklets with your custom wording on the inside. The beautiful black covers of our tropical night booklet are imprinted with a gold or silver foil palm tree and your personalized four lines of wording. Plus, each booklet includes a cord and tassel for binding. Send students home at the end of the night with a favor! Our custom creation tropical forever tonight frame is a perfect choice for this theme. Students can add their favorite 5×7 photo to the plastic frame printed with a beautiful tropical photo. Plus, the frame can be personalized with your prom logo and slogan! Check out Stump Party’s other nautical event theme proms and planning tips for your event!